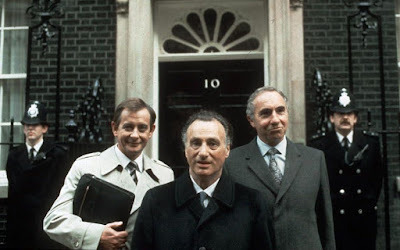 Sir Humphrey was cynical, but he wasn't wrong. At least since the time of Elizabeth I, England (and later the UK) intervened in Europe to prevent any one power from growing too strong. It would conduct diplomacy, and fight wars if needed, to constrain strong governments on the Continent. This held true as great powers rose and fell, from Habsburg Spain to Napoleonic France to imperial Germany. In this way the UK was able to promote its own trade, security, and other national interests. If only someone had told the modern Conservatives. Back in Thatcher's day, this was exactly the kind of cold-blooded statecraft they embraced; but the foreign policy realists aren't in charge any more. Instead, the party leadership are terrified of a minority of fanatical anti-Europeans, who fear the EU will contaminate our precious bodily fluids. The Liberal Democrats enabled Cameron to ignore the fanatics for five years. Then he went and won a majority, called his EU referendum, and brought down consequences we all must endure. Britain is disengaging from Europe; in part, because it feels a strategy older than the UK itself is too difficult and complicated to be worth the effort. Why bother with knowing things and making compromises, when being lazy and stupid is so much easier? It is this, above all else, which Brexit has in common with Trump. They are not so much victories for nationalism, as for pig-headed ignorance. Other governments can and will step into the gap left by the UK. Chancellor Merkel of Germany and President Macron of France have formed a close working relationship, and have an opportunity to shape the future direction of the EU to their liking. This is likely to be good for France and Germany. It may be good for the EU 27 as a whole. It is most unlikely to be good for the UK. It's not that the post-Brexit EU will have any particular hostility to Britain; but it will have its own needs and priorities, which will sometimes conflict with those of the UK. When that happens, the EU can easily afford to ignore the UK and do as it pleases. Sir Humphrey would have been appalled.